This naturalization ceremony in Hartford demonstrates the importance of the immigrant community in Connecticut. 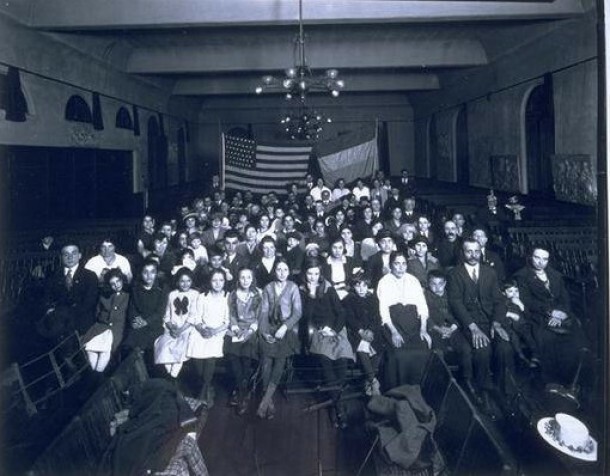 At the time of this photograph, the majority of immigrants were coming to Connecticut from Southern and Eastern Europe in attempts to flee the economic and political instability of their native lands. Many Yankees saw the high birth rates, different customs, and most of all the Catholicism of these newcomers as a threat to tradition. However, the immigrants held an important role as industrial workers in Connecticut’s many manufacturing plants. The immigrant population continued to grow over many years. By 1900, 23% of the state’s residents had been born abroad, and 27% were first generation Americans. At the same period in time, over half of Hartford’s citizens were foreign born. One of the greatest increases was in the Italian population. From 1870 to 1920, the Italian population in the state jumped from less than 100 to over 80,000.